Make some time for the Force, you must! 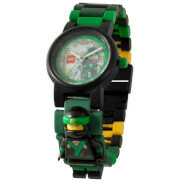 Train to become a JEDI with the LEGO® Star Wars™ Yoda™ minifigure link watch. Featuring multi-coloured, interchangeable links, this analog watch offers plenty of design possibilities to build a unique watch that fits all wrist sizes. With your favourite LEGO® Star Wars™ character integrated into your watch strap, use the force and your legendary wisdom to train the future of the Jedi order.